It's frustrating when insects attack our vegetables. 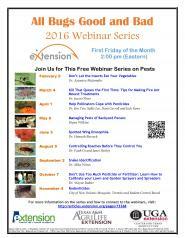 Learn practical tips for pest problems from Extension specialists. Tune in here. Winter is the season for Farmer Delusional Syndrome. Fields do not have weeds, projects will take half the time and pictures in the seed catalogues tempt you to grow every new variety being offered for the next year. When reality sets in, vegetable growers realize that their winter planning decisions need to be based on data collected for their farm that reflects their soil, weather patterns and growing practices. Join Rob Faux in a farminar where he shares some of the data he collects and how it informs vegetable variety planning on his farm. Rob and his wife Tammy Faux own and operate Genuine Faux Farm, a vegetable CSA and poultry operation near Tripoli, Iowa. Rob has been conducting on-farm research for 8 years and regularly uses this data to inform production decisions. Cover crop options for home gardens. Iowa State University Extension and Outreach is hosting the 2018 Fruit and Vegetable Field Day on Monday, Aug. 6, 2018 at the Iowa State University Horticulture Research Station near Ames. The annual event will feature various research and demonstration projects on fruit and vegetable production for commercial growers, extension personnel, non-profit organizations, and Master Gardeners. Bill and Judy Goshorn, Polk County Master Gardeners, will present about all things tomatoes - growing, varieties, and preserving. BYOT (bring your own tomatoes to share).